The highlights of Pacifico is the grid that create the activeness for this templale. Pacifico make up your store with light colors and subtle design. It also has a lot of fuctions from 11 OpenCart modules that gear to the convenience of customer. Pacifico is perfect for every kind of web shop. With the amazing appearance and powerful admin panel, our product will take an important role in your successful store. This theme is compatible with OpenCart 1.5.4.x, 1.5.5.x and 1.5.6.x !. So if you want to use the theme but have an older version of OpenCart, you must update your OpenCart version first! 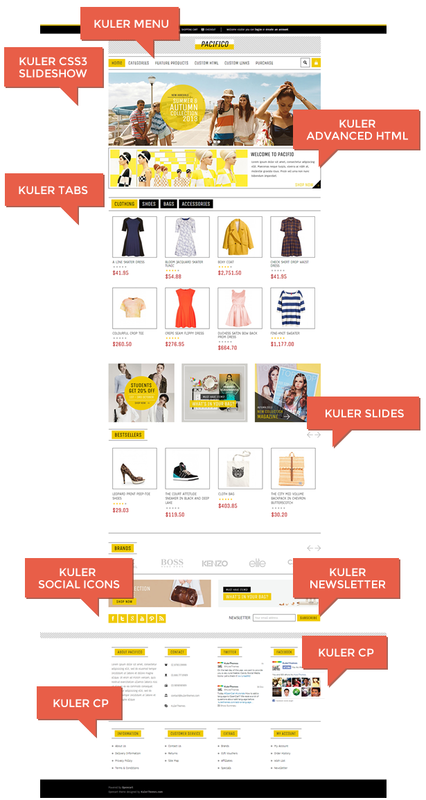 Item Reviewed: Pacifico – A subtle responsive OpenCart theme 9 out of 10 based on 10 ratings. 9 user reviews.